Students crowd in front of the stage at last semester's Fall Fest Concert Series. The Student Association is planning this semester's Spring Fest as one show on Saturday, May 4. Spring Fest will feature hip-hop performers on Saturday, May 4, according to Student Association President Gunnar Haberl. Over the winter, Haberl and SA Entertainment reviewed student survey results to decide the genre. Students completed roughly 1,000 surveys about future SA programs last fall, Haberl said, and students were “pretty clear” about wanting hip-hop artists. “My goal of this fest is to really listen to the student voice and provide that final experience that people will be able to look back and remember. [I’m] excited for what it can be,” Haberl said. SA hasn’t held an outdoor music festival since the 2017 Fall Fest at Baird Point. SA has held its biannual fests in different locations. Last year’s Spring Fest was in Alumni Arena, while last semester’s Fall Fest performers played in the Center for the Arts. SA broke up last semester’s Fall Fest into the Fall Fest Concert Series and opted for three genre-specific shows instead of one concert date. Haberl said Spring Fest will be returning to the single-show format, but he still hopes to bring something new to the stage. “I challenge the [SA] Entertainment team with what we can do differently in the show to have that student experience be better. So, can we do a giveaway for the first however many students that come to the show? Can we have a host DJ come in so there’s not too much dead space in between acts? Things like that,” Haberl said. Haberl said he hopes to make the show announcement “earlier” in the semester. SA’s entertainment team already reached out to artists and has been negotiating contracts as of Jan. 7, according to Haberl. 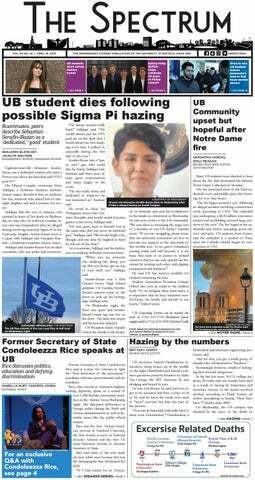 Brenton J. Blanchet is the managing editor and can be reached at Brenton.Blanchet@ubspectrum.com and on Twitter @BrentBlanchSpec. Brenton J. Blanchet is The Spectrum's managing editor and a junior communication major. He specializes in interviews with rising pop stars, but makes sure to still give UB the news scoop. The Spectrum elected Brenton Blanchet as editor-in-chief for the 2019-20 academic year. Blanchet has been writing for The Spectrum since 2016.